Cambro SCP12CW135 Camwear Clear Polycarbonate Scoop - 12 oz. Cambro SCP6CW135 Camwear Clear Polycarbonate Scoop - 6 oz. Keep all of your bulk ingredients fresh and safe from contaminants with this Cambro IBS20148 21 gallon slant top ingredient bin. 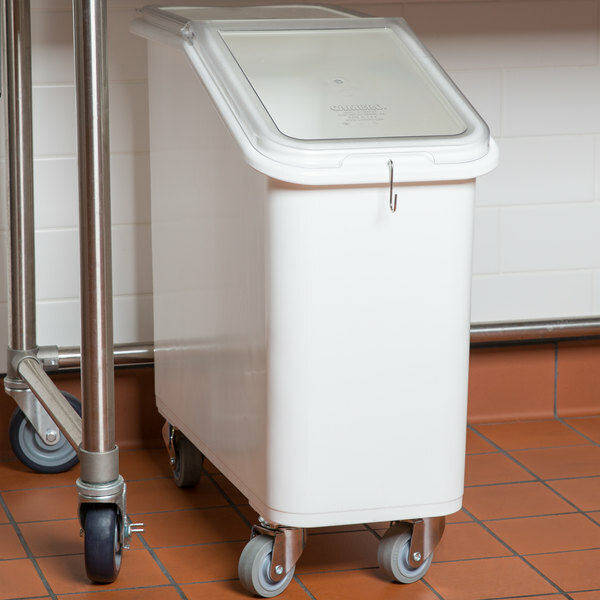 Easily maintain a clean, organized, and efficient kitchen by using this Cambro 21 gallon mobile ingredient bin for storing bulk ingredients! 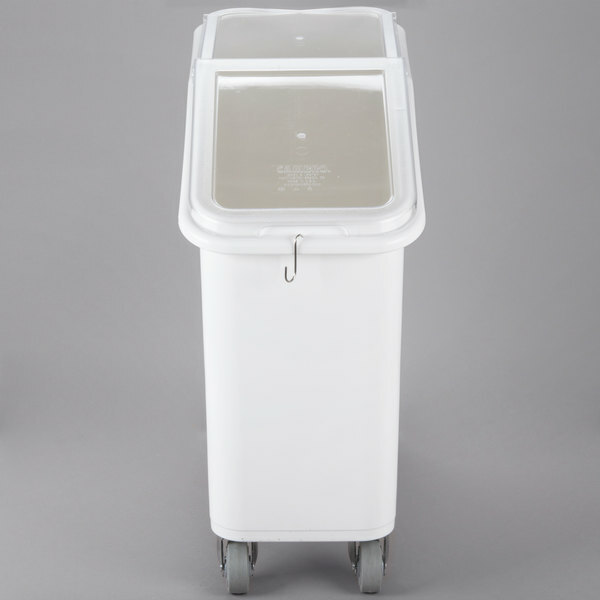 Perfect for any kitchen, whether in a cafe, elementary school, or large resort, this bin is designed for your convenience and to promote food safety so that you can cook with ease and serve your customers safe, delicious meals. "These are simply the best ingredient bins for items used regularly. They slide conveniently under a 30" metal bakery table and arrive with the casters already attached. Easy to move, easy to clean." 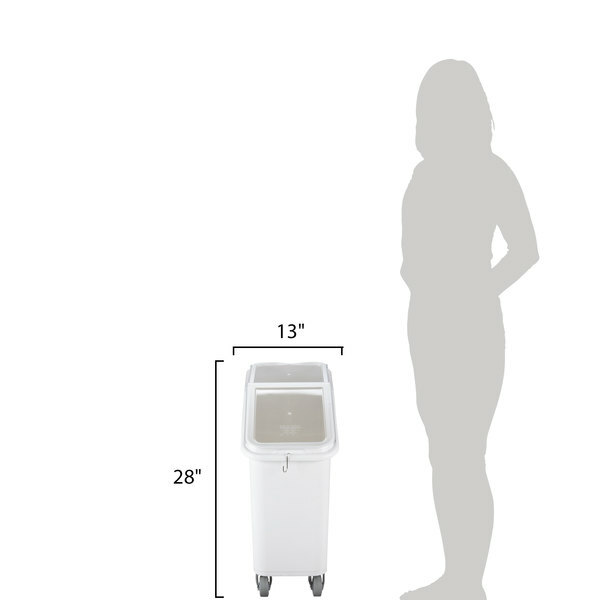 With its 21 gallon capacity, you can store up to 170 lb. of sugar or 140 lb. of flour. This bulk storage capacity makes it perfect for bakeries, hotels, and coffee shops, as well as any other business producing a high output of baked goods or other repeat orders. A clear Camwear lid reduces handling and allows for quick product identification, making your work quicker and more efficient. Plus, the lid helps to lock in freshness, maintaining the integrity of the food product until use. 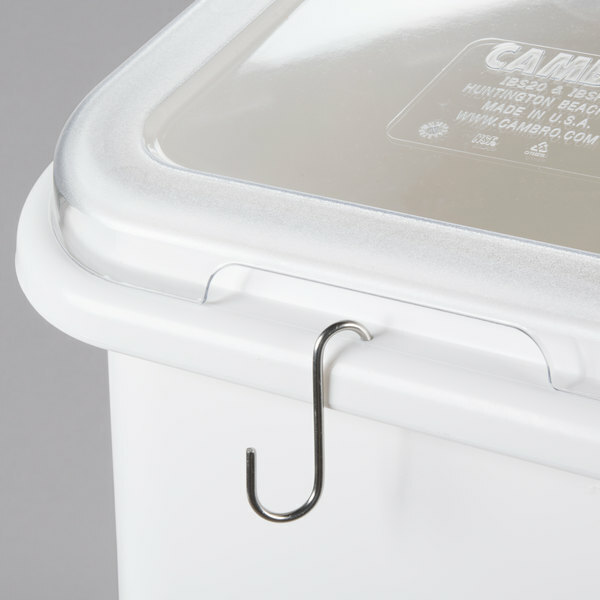 Thanks to an S-hook, you can hang a utility scoop (sold separately) on the front of the bin to comply with health codes that prohibit scoops from being stored inside the bin. 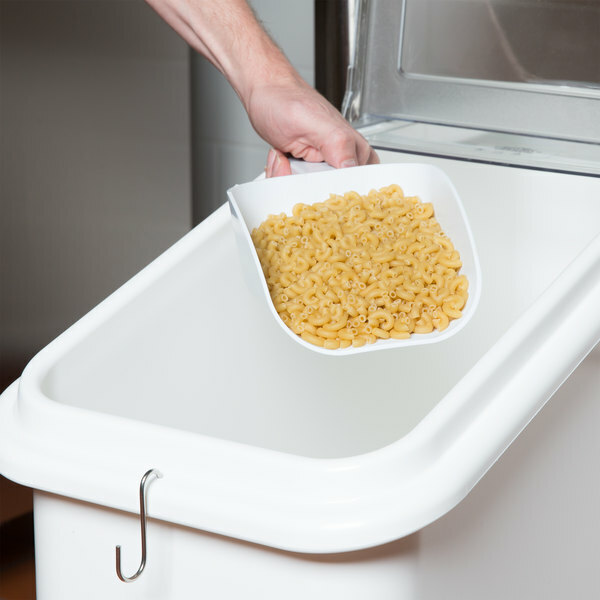 Made of FDA-accepted materials, this bin is safe for direct food contact, eliminating the need for a bin liner. This means you get to keep the money you would have spent on liners and use it for other needs around the kitchen. 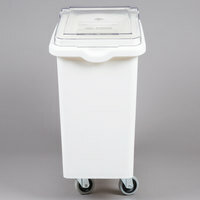 In addition, this bin is designed to fit under standard counters for convenient access and space saving storage. Heavy-duty, 3" casters provide easy mobility as you transport ingredients around the kitchen and out from under the counter to clean. 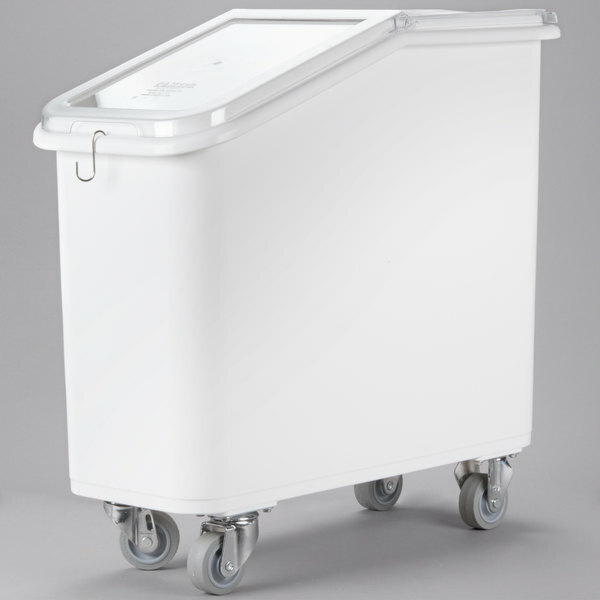 This 21 gallon mobile ingredient bin is great for storing some of our dry ingredients that we use to make donuts. The wheels on the bottom allow it to move - which is very convenient for us. These are a lifesaver! It comes with the wheels attached, just lift out of the box and slide the lid on and it is ready to be used. 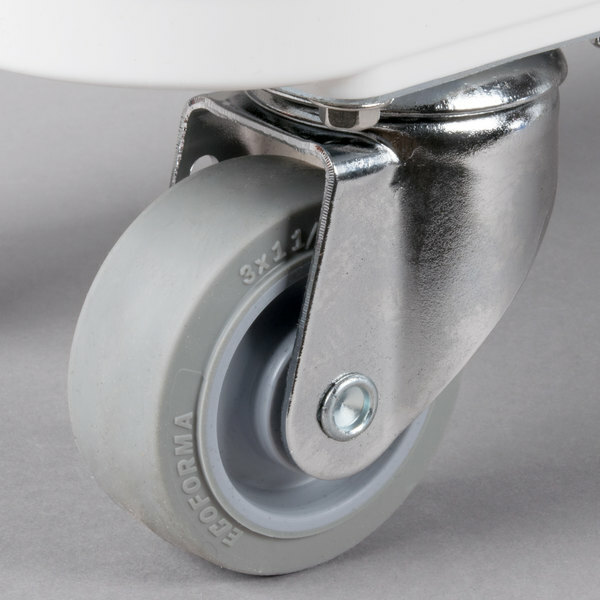 The wheels are sturdy and glide well across our sealed concrete floors. 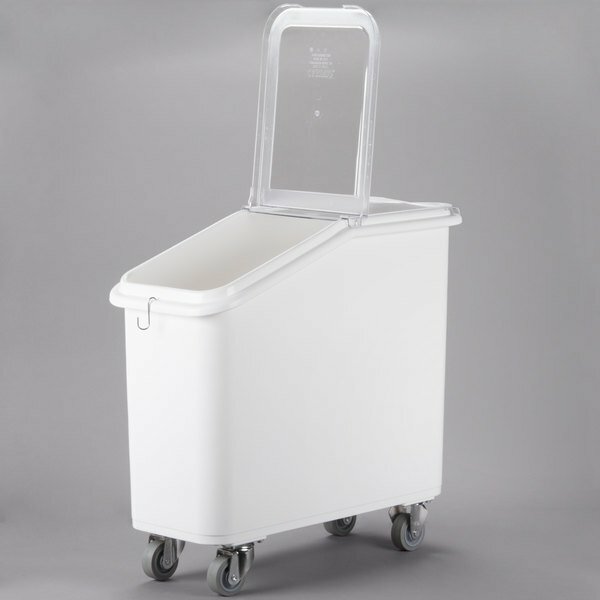 The Cambro 21 Gallon Mobile Ingredient Bin is great! It is heavy weight and the lids fits well, keeping the contents fresh. 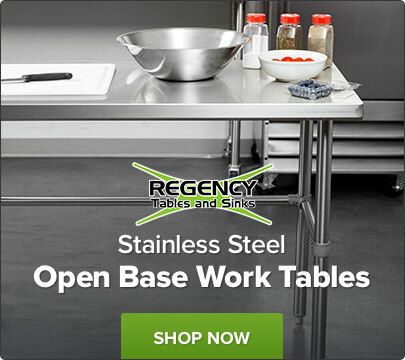 I would recommend this for any commercial kitchen. spend the extra money for the Cambro Bins. These hold up great and never get cracks in the lids or corners. They have saved me a lot of money by simply holding up to the abuse of a bakery. These are simply the best ingredient bins for items used regularly. They slide conveniently under a 30" metal bakery table and arrive with the casters already attached. Easy to move, easy to clean. Great product for the price. Does not come with a scoop though like the smaller ones do but it does have a hood for one. Easy to fill and reach into. Great product. You have to keep your ingredients in clean containers and out of the way. 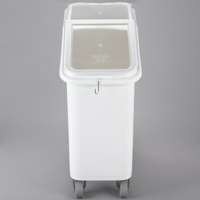 The lids are always problematic with bins like these, but this product holds up and has withstood a punishing kitchen. I purchased this product to hold flour. The bin's mobility is so nice. 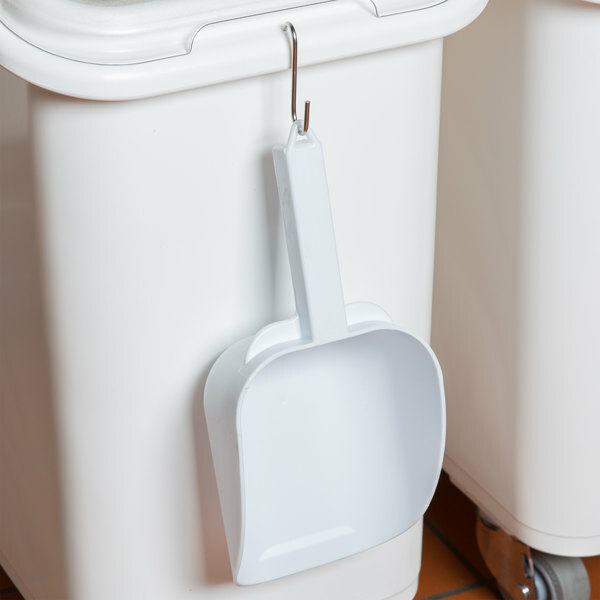 It rolls and moves about effortlessly and the thinness of this bin makes tucking it in tight places a breeze. This bin comes with the wheels already attached so there is no assemble which is great. I think they should come with a scoop and the lid could be a little better built, but overall a great option for a bin. 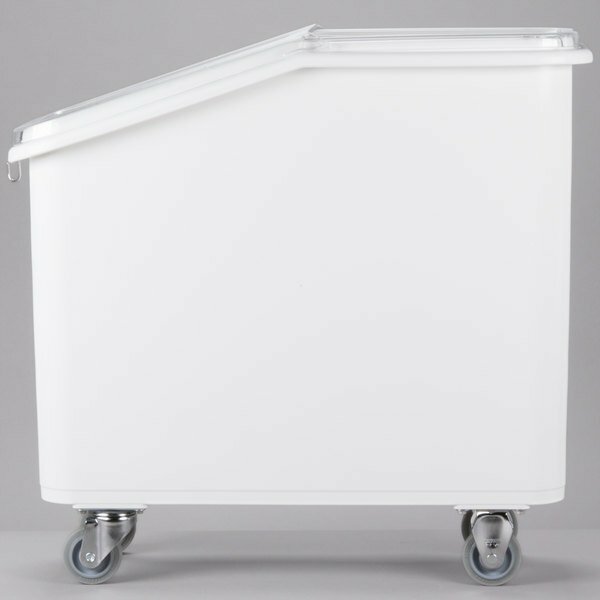 These are strong bins for holding a lot of flour, sugar and other dry goods. Nice easy to use sliding lids make it easy to prevent contamination. No problems here! The quality is great, it holds a ton of weight (this currently holds almost 200 lbs of chocolate chips), and it slides on the casters no problem! WE LOVE THESE! Easily stores lots of the flours we use regularly, and the wheels allow us to move them around the kitchen to scoop contents by the cup into bowls. (We do everything in small batches). Easy to wipe down, too!